The Napoleonic Wars comprised a series of global conflicts fought during Napoleon Bonaparte's imperial rule over France (1805–1815). They formed to some extent an extension of the wars sparked by the French Revolution of 1789. These wars revolutionized European armies and artillery, as well as military systems, and took place on a scale never before seen, mainly due to the application of modern mass conscription. French power rose quickly, conquering most of Europe; and collapsed rapidly after the disastrous invasion of Russia (1812), and Napoleon's empire ultimately suffered complete military defeat, resulting in the restoration of the Bourbon monarchy in France in 1814 and 1815. The Napoleonic Wars brought great changes to Europe. Though Napoleon brought most of Western Europe under his rule (a feat not seen since the days of the Roman Empire), a state of constant warfare between France and the combined other major powers of Europe for over two decades finally took its toll. By the end of the Napoleonic Wars, France no longer held the role of the dominant power in Europe, as it had since the times of Louis XIV. The United Kingdom emerged as one of the most powerful countries in the world, effectively becoming the first real hyperpower. The British Royal Navy held unquestioned naval superiority throughout the world, and Britain's industrial economy made it the most powerful commercial country. The French Revolution posed an implied threat to monarchies throughout Europe, which only increased with the arrest and execution of King Louis XVI of France in 1792 - 1793. The first attempt to crush the French Republic came in 1792 when Austria, Piedmont, the Kingdom of Naples, Prussia, Spain, and the Kingdom of Great Britain formed the First Coalition. French measures, including general conscription (levée en masse), military reform, and total war, contributed to the defeat of the First Coalition. The war ended when Bonaparte forced the Austrians to accept his terms in the Treaty of Campo Formio. The United Kingdom remained the only anti-French power still in the field by 1797. The Second Coalition, formed in 1798, consisted of the following nations or states: Austria, Great Britain, the Kingdom of Naples, the Ottoman Empire, Papal States, Portugal, and Russia. During the War of the Second Coalition, the French Republic suffered from corruption and division under the Directory. France also lacked funds to prosecute the war and no longer had the services of Lazare Carnot, the war-minister who had guided her to successive victories following extensive reforms during the early 1790s. 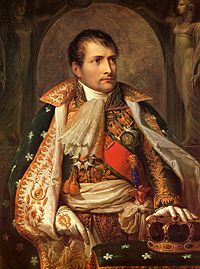 Napoleon Bonaparte, the main architect of victory in the last years of the First Coalition, had gone to campaign in Egypt. Stripped of two of its most important military figures from the previous conflict, the Republic suffered successive defeats against revitalized enemies which British financial support brought back into the war. Napoleon managed to return to France on August 23, 1799. He seized control of the French government on November 9, 1799 in the coup of 18 Brumaire, toppling the Directory. Napoleon reorganized the French military and created a reserve army positioned to support campaigns either on the Rhine or in Italy. On all fronts, French advances caught the Austrians off-guard. In Italy, Napoleon won a victory against the Austrians at Marengo (1800). However, the decisive battle came on the Rhine at Hohenlinden in 1800. The defeated Austrians left the conflict after the Treaty of Lunéville (February 9, 1801). Thus the Second Coalition ended in another French triumph. However, the United Kingdom remained an important influence on the continental powers in encouraging their resistance to France. London had brought the Second Coalition together through subsidies, and Napoleon realized that without British defeat or a treaty with the UK he could not achieve a complete peace. Unlike its many coalition partners, Britain remained at war throughout the entire period of the Napoleonic Wars. Protected by naval supremacy, the United Kingdom was able to maintain a low-cost low-intensity warfare on a global scale for over a decade. Commitment increased in the Peninsula War, where, protected by topography, guerrilla activity, and sometimes massive earthworks, the British army succeeded in harassing French forces for several years. 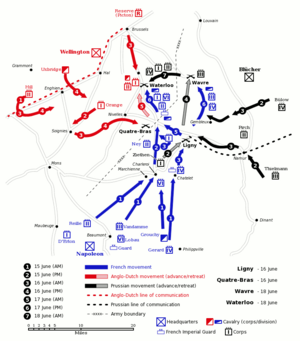 By 1815, the British army would play a central role in the final defeat of Napoleon at Waterloo. The Treaty of Amiens (March 25, 1802) resulted in peace between the UK and France, and marked the final collapse of the Second Coalition. But the Treaty always seemed unlikely to endure: it satisfied neither side, and both sides dishonored parts of it. Military actions soon clouded the peace: the French intervened in the Swiss civil strife (Stecklikrieg) and occupied several coastal cities in Italy, while the United Kingdom occupied Malta. Napoleon attempted to exploit the brief peace at sea to restore the colonial rule in the rebellious Antilles. The expedition, though initially successful, would soon turn to a disaster, with the French commander and Bonaparte’s brother-in-law, Charles Leclerc, dying of yellow fever and almost his entire force destroyed by the disease combined with the fierce attacks by the rebels. Hostilities between Great Britain and France recommenced on May 18, 1803. The Allied war-aims changed over the course of the conflict: a general desire to restore the French monarchy became an almost manichean struggle to stop Bonaparte. 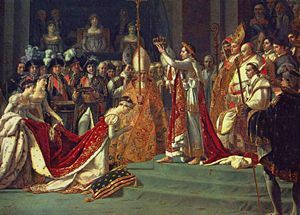 Bonaparte declared France an Empire on May 18, 1804 and crowned himself Emperor at Notre-Dame on December 2. The series of naval and colonial conflicts, including a large number of minor naval actions (such as the Action of 1805) gave perhaps a clear sign of the new nature of war. Conflicts in the Caribbean, and in particular the seizure of colonial bases and islands throughout the wars, would directly and immediately have an effect upon the European conflict, and battles thousands of miles apart could influence each other's outcomes. The Napoleonic conflict had reached the point at which subsequent historians could talk of a "world war." Only the Seven Years' War offered a precedent for widespread conflict on such a scale. Napoleon planned an invasion of the British Isles, and massed 180,000 troops at Boulogne. However, in order to mount his invasion, he needed to achieve naval superiority—or at least to pull the British fleet away from the English Channel. A complex plan to distract the British by threatening their possessions in the West Indies failed when a Franco-Spanish fleet under Admiral Villeneuve turned back after an indecisive action off Cape Finisterre on 22 July 1805. The Royal Navy blockaded Villeneuve in Cádiz until he left for Naples on October 19, but Lord Nelson caught and defeated his fleet at the Battle of Trafalgar on October 21. This battle cost Admiral Nelson his life as a result of a French bullet, but Napoleon would never again have the opportunity to challenge the British at sea. By this time, however, Napoleon had already all but abandoned plans to invade the British Isles, and had turned his attention to enemies on the Continent once again. The French army left Boulogne and moved towards Austria. In April 1805 the United Kingdom and Russia signed a treaty with the aim of removing the French from Holland and Switzerland. Austria joined the alliance after the annexation of Genoa and the proclamation of Napoleon as King of Italy on 17 March 1805. The Austrians began the war by invading Bavaria with an army of about 70,000 under Karl Mack von Leiberich, and the French army marched out from Boulogne in late July, 1805 to confront them. At Ulm (September 25 - October 20) Napoleon managed to surround Mack's army in a brilliant envelopment, forcing its surrender without significant losses. With the main Austrian army north of the Alps defeated (another army under Archduke Charles maneuvered inconclusively against André Masséna's French army in Italy), Napoleon occupied Vienna. Far from his supply lines, he faced a superior Austro-Russian army under the command of Mikhail Kutuzov, with the Emperor Alexander of Russia personally present. On December 2 Napoleon crushed the joint Austro-Russian army in Moravia at Austerlitz (usually considered his greatest victory). He inflicted a total of 25,000 casualties on a numerically superior enemy army while sustaining fewer than 7,000 in his own force. After Austerlitz, Austria signed the Treaty of Pressburg (December 26, 1805) and left the Coalition. The Treaty required the Austrians to give up Venetia to the French-dominated Kingdom of Italy and Tyrol to Bavaria. Napoleon in Berlin (Meynier). 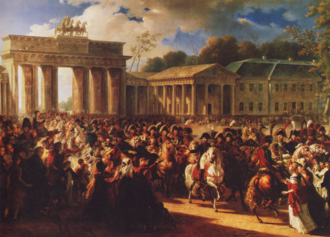 After defeating Prussian forces at Jena, the French Army entered Berlin on October 27, 1806. The Fourth Coalition (1806–1807) of Prussia, Russia, Saxony, Sweden and the United Kingdom against France formed within months of the collapse of the previous coalition. In July 1806 Napoleon formed the Confederation of the Rhine out of the many tiny German states which constituted the Rhineland and most other parts of western Germany. He amalgamated many of the smaller states into larger electorates, duchies and kingdoms to make the governance of non-Prussian Germany smoother. Napoleon elevated the rulers of the two largest Confederation states, Saxony and Bavaria, to the status of kings. In August 1806 the Prussian king, Friedrich Wilhelm III made the decision to go to war independently of any other great power, save the distant Russia. A more sensible course of action might have involved declaring war the previous year and joining Austria and Russia. This might have contained Napoleon and prevented the Allied disaster at Austerlitz. In any event, the Russian army, an ally of Prussia, still remained far away when Prussia declared war. In September Napoleon unleashed all French forces east of the Rhine. Napoleon himself defeated a Prussian army at Jena (October 14 1806), and Davout defeated another at Auerstädt on the same day. Some 160,000 French soldiers (increasing in number as the campaign went on) went against Prussia and moved with such speed that Napoleon was able to destroy as an effective military force the entire quarter of a million strong Prussian army—which sustained 25,000 casualties, lost a further 150,000 prisoners and 4,000 artillery pieces, and over 100,000 muskets stockpiled in Berlin. In the former battle Napoleon only fought a detachment of the Prussian force. The latter battle involved a single French corps defeating the bulk of the Prussian army. Napoleon entered into Berlin on 27 October 1806 and visited the tomb of Frederick the Great, there instructing his marshals to remove their hats, saying, "If he was alive we wouldn't be here today." In total Napoleon had taken only 19 days from beginning his attack on Prussia until knocking it out of the war with the capture of Berlin and the destruction of its principal armies at Jena and Auerstadt. By contrast Prussia had fought for three years in the War of the First Coalition with little achievement. In Berlin, Napoleon issued a series of decrees which, on November 21, 1806 brought into effect the Continental System. This policy aimed to eliminate the threat of the United Kingdom by closing French-controlled territory to its trade. The United Kingdom's army remained a minimal threat to France; the UK maintained a standing army of just 220,000 at the height of the Napoleonic Wars, whereas France's strength peaked at over 1,500,000 in addition to the armies of numerous allies and several hundred thousand national guards that Napoleon could draft into the military if necessary. The Royal Navy however was instrumental in disrupting France's extra-continental trade - both by seizing and threatening French shipping and by seizing French colonial possessions - but could do nothing about France's trade with the major continental economies and posed no threat to French territory in Europe. In addition France's population and agricultural capacity far outstripped that of the United Kingdom. However, the United Kingdom's industrial capacity was the greatest in Europe and its mastery of the seas allowed it to build up considerable economic strength through trade. That was sufficient to ensure that France was never able to consolidate its control over Europe in peace. However, many in the French government believed that cutting the United Kingdom off from the Continent would end its economic influence over Europe and isolate it. This was what the Continental System was designed to achieve, although it never succeeded in this objective. The next stage of the war involved the French driving Russian forces out of Poland and creating a new Duchy of Warsaw. Napoleon then turned north to confront the remainder of the Russian army and to attempt to capture the temporary Prussian capital at Königsberg. A tactical draw at Eylau (February 7–8) forced the Russians to withdraw further north. Napoleon then routed the Russian army at Friedland (June 14). Following this defeat, Alexander had to make peace with Napoleon at Tilsit (July 7, 1807). By September, Marshal Brune completed the occupation of Swedish Pomerania, allowing the Swedish army, however, to withdraw with all its munitions of war. The Fifth Coalition (1809) of the United Kingdom and Austria against France formed as the United Kingdom engaged in the Peninsular War against France. Once again, the United Kingdom stood alone, and the sea became the major theatre of war between the United Kingdom and Napoleon's allies. During the time of the Fifth Coalition, the Royal Navy won a succession of victories in the French colonies and another major naval victory against the neutral Denmark at the Battle of Copenhagen (September 2 1807). On land, the Fifth Coalition attempted few extensive military endeavors. One, the Walcheren Expedition of 1809, involved a dual effort by the British Army and the Royal Navy to relieve Austrian forces under intense French pressure. It ended in disaster after the Army commander - John Pitt, 2nd Earl of Chatham - failed to capture the objective, the naval base of French-controlled Antwerp. For the most part of the years of the Fifth Coalition, British military operations on land—outside of the Peninsular War—remained restricted to hit-and-run operations. These were executed by the Royal Navy, who dominated the sea after having beaten down almost all substantial naval opposition from France and its allies and blockading what remained of the latter's naval forces in heavily fortified French-controlled ports. These rapid-attack operations were a sort of exo-territorial guerrilla strikes: they were aimed mostly at destroying blockaded French naval and mercantile shipping, and disrupting French supplies, communications, and military units stationed near the coasts. Often, when British allies attempted military actions within several dozen miles or so of the sea, the Royal Navy would be present and would land troops and supplies and aid the allied land forces in a concerted operation. Royal Navy ships were even known to provide artillery support against French units should fighting stray near enough to the coastline. However, these operations were limited to the ability and quality of the land forces. For example, when operating with inexperienced guerrilla forces in Spain, the Royal Navy sometimes failed to achieve their objectives simply for lack of manpower that was supposed to have been supplied for the operation by the Navy's guerrilla allies. 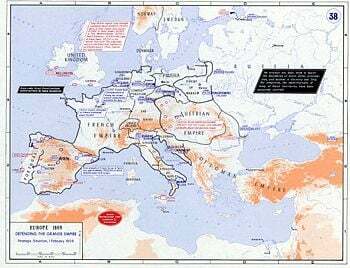 The European strategic situation in February 1809. The struggle also continued in the sphere of economic warfare—the French Continental System vs. the British naval blockade of French-controlled territory. Due to military shortages and lack of organization in French territory, numerous breaches of the Continental System occurred as French-dominated states engaged in illicit (though often tolerated) trade with British smugglers. Both sides entered additional conflicts in attempts to enforce their blockade; the British fought the United States in the War of 1812 (1812-1814), and the French engaged in the Peninsular War (1808-1814). The Iberian conflict began when Portugal continued trade with the United Kingdom despite French restrictions. 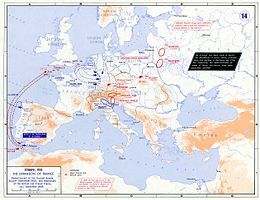 When Spain failed to maintain the system the alliance with France came to an end and French troops gradually encroached on its territory until Madrid was occupied. British intervention soon followed. Napoleon had enjoyed easy success in Spain, retaking Madrid, defeating the Spanish and consequently forcing a withdrawal of the heavily out-numbered British army from the Iberian Peninsula (Battle of Corunna, January 16, 1809). Austria's attack prevented Napoleon from successfully wrapping up operations against British forces by necessitating his departure for Austria, and he never returned to the Peninsula theatre. In his absence and in the absence of his best marshals (Davout remained in the east throughout the war) the French situation deteriorated, especially when the prodigious British general, Sir Arthur Wellesley, arrived to command the British forces. The Austrians drove into the Duchy of Warsaw, but suffered defeat at the Battle of Radzyn April 19, 1809. The Polish army captured West Galicia following its earlier success. The French Empire in Europe in 1811, near its peak extent. 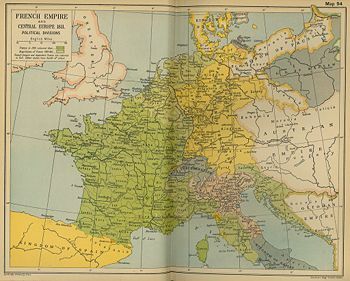 Dark and light green areas indicate the French Empire and its territories; blue, pink and yellow areas indicate French client and satellite states. The War of the Fifth Coalition ended with the Treaty of Schönbrunn (October 14, 1809). In the east only the Tyrolese rebels led by Andreas Hofer continued to fight the French-Bavarian army until finally defeated in November 1809, while in the west the Peninsular War continued. In 1810 the French Empire reached its greatest extent. On the continent, the British and Portuguese remained restricted to the area around Lisbon behind their impregnable lines of Torres Vedras. Napoleon married Marie-Louise, an Austrian Archduchess, in order to ensure a more stable alliance with Austria and to provide the Emperor with an heir, something his first wife, Josephine, had failed to do. As well as the French empire, Napoleon controlled the Swiss Confederation, the Confederation of the Rhine, the Duchy of Warsaw and the Kingdom of Italy. Allied territories included: the Kingdom of Spain (Joseph Bonaparte); Kingdom of Westphalia (Jerome Bonaparte); the Kingdom of Naples (Joachim Murat, brother-in-law); Principality of Lucca and Piombino (Felix Bacciochi, brother-in-law); and his former enemies, Prussia and Austria. The Sixth Coalition (1812–1814) consisted of the United Kingdom and Russia, Prussia, Sweden, Austria and a number of German States. In 1812 Napoleon invaded Russia. He aimed to compel Emperor Alexander I to remain in the Continental System and to remove the imminent threat of a Russian invasion of Poland. The French-led Grande Armée, consisting of 650,000 men (270,000 Frenchmen and many soldiers of allies or subject areas), crossed the Niemen River on June 23 1812. Russia proclaimed a Patriotic War, while Napoleon proclaimed a Second Polish war, but against the expectations of the Poles (who supplied almost 100,000 troops for the invasion-force) he avoided any concessions to Poland, having in mind further negotiations with Russia. Russia maintained a scorched-earth policy of retreat, broken only by the Borodino on September 7. This bloody confrontation ended in a tactical draw, but Napoleon eventually forced the Russians to back down, thus opening the road to Moscow. By September 14, 1812 the Grande Armée had captured Moscow; although by this point the Russians had largely abandoned the city, even releasing prisoners from Moscow's prisons to inconvenience the French. Alexander I refused to capitulate, and with no sign of clear victory in sight Napoleon had to withdraw from Moscow after the governor, Count Fyodor Vasilievich Rostopchin, allegedly ordered the city burnt to the ground. So the disastrous Great Retreat began, with 370,000 casualties largely as a result of starvation and the freezing weather conditions, and 200,000 captured. By November, when the remnants of the Grande Armée crossed the Berezina River, only 27,000 fit soldiers remained. Napoleon then left his army and returned to Paris to prepare the defense of Poland from the advancing Russians. The situation was not as dire as it might at first have seemed — the Russians had lost around 400,000 men and their army was similarly depleted. However they had the advantage of shorter supply lines and were able to replenish their armies with greater speed than the French. Meanwhile, in the Peninsular War, at Vitoria (June 21, 1813), Arthur Wellesley's victory over Joseph Bonaparte finally broke the French power in Spain. The French had to retreat out of Spain, over the Pyrenees. Seeing an opportunity in Napoleon's historic defeat, Prussia re-entered the war. Napoleon vowed that he would create a new army as large as that he had sent into Russia, and quickly built up his forces in the east from 30,000 to 130,000 and eventually to 400,000. Napoleon inflicted 40,000 casualties on the Allies at Lützen (May 2) and Bautzen (May 20 - 21, 1813). Both battles involved total forces of over 250,000—making them some of the largest conflicts of the wars so far. The belligerents declared an armistice from June 4, 1813 (continuing until August 13) during which time both sides attempted to recover from approximately quarter of a million losses since April. During this time Allied negotiations finally brought Austria out in open opposition to France. Two principal Austrian armies took the field, adding an additional 300,000 troops to the Allied armies in Germany. In total the Allies now had around 800,000 front-line troops in the German theatre, with a strategic reserve of 350,000 formed to support the frontline operations. Napoleon succeeded in bringing the total imperial forces in the region up to around 650,000—although only 250,000 came under his direct command, with another 120,000 under Nicolas Charles Oudinot and 30,000 under Davout. The Confederation of the Rhine furnished Napoleon with the bulk of the remainder of his forces, with Saxony and Bavaria as the principal contributors. In addition, to the south, Murat's Kingdom of Naples and Eugène de Beauharnais's Kingdom of Italy had a combined total of 100,000 men under arms. In Spain an additional 150,000 to 200,000 French troops steadily retreated before Spanish and British forces numbering around 150,000. Thus in total around 900,000 French troops in all theatres faced somewhere around a million Allied troops (not including the strategic reserve under formation in Germany). The gross figures may however mislead slightly, as most of the German troops fighting on the side of the French were unreliable at best and on the verge of defecting to the Allies. It is reasonable to say that Napoleon could count on no more than 450,000 troops in Germany—which left him outnumbered about two to one. Following the end of the armistice, Napoleon seemed to have regained the initiative at Dresden (August 1813), where he defeated a numerically-superior allied army and inflicted enormous casualties, while the French army sustained relatively few. However the failures of his marshals and a slow resumption of the offensive on his part cost him any advantage that this victory might have secured him. At the Battle of Leipzig in Saxony (October 16 - 19, 1813), also called the "Battle of the Nations," 191,000 French fought more than 300,000 Allies, and the defeated French had to retreat into France. Napoleon then fought a series of battles, including the Battle of Arcis-sur-Aube, in France itself, but the overwhelming numbers of the Allies steadily forced him back. The Allies entered Paris on March 30, 1814. During this time Napoleon fought his Six Days Campaign, in which he won multiple battles against the enemy forces advancing towards Paris. However, during this entire campaign he never managed to field more than 70,000 troops against more than half a million Allied troops. At the Treaty of Chaumont (March 9, 1814) the Allies agreed to preserve the Coalition until Napoleon's total defeat. Napoleon determined to fight on, even now, incapable of fathoming his massive fall from power. During the campaign he had issued a decree for 900,000 fresh conscripts, but only a fraction of these ever materialized, and Napoleon's increasingly unrealistic schemes for victory eventually gave way to the reality of the hopeless situation. Napoleon abdicated on April 6. However, occasional military actions continued in Italy, Spain and Holland throughout the spring of 1814. The victors exiled Napoleon to the island of Elba, and restored the French Bourbon monarchy in the person of Louis XVIII. They signed the Treaty of Fontainebleau (April 11, 1814) and initiated the Congress of Vienna to redraw the map of Europe. [[|Denmark|Denmark-Norway]] originally declared itself neutral in the Napoleonic Wars, established a navy, and engaged in trade with both sides. The British attacked, captured, and or destroyed large portions of the Danish fleet in the First Battle of Copenhagen (April 2, 1801), and again in the Second Battle of Copenhagen (August–September 1807). This ended the Danish neutrality, and the Danish engaged in a naval guerilla war in which small gunboats would attack larger British ships in Danish and Norwegian waters. The Gunboat War effectively ended with a British victory at the Battle of Lyngør in 1812, involving the destruction of the last large Danish ship—a frigate. The Seventh Coalition (1815) pitted the United Kingdom, Russia, Prussia, Sweden, Austria, the Netherlands and a number of German states against France. The period known as the Hundred Days began after Napoleon left Elba and landed at Cannes (March 1, 1815). Travelling to Paris, picking up support as he went, he eventually overthrew the restored Louis XVIII. The Allies rapidly gathered their armies to meet him again. Napoleon raised 280,000 men, whom he distributed amongst several armies. To add to the 90,000 troops in the standing army he recalled well over a quarter of a million veterans from past campaigns and issued a decree for the eventual draft of around 2.5 million new men into the French army. This faced an initial Allied force of about 700,000—although Allied campaign plans provided for one million frontline troops supported by around 200,000 garrison, logistics and other auxiliary personnel. This force was intended to be overwhelming against the numerically inferior imperial French army which never came close to reaching Napoleon's goal of more than 2.5 million under arms. Napoleon took about 124,000 men of the Army of the North on a pre-emptive strike against the Allies in Belgium. He intended to attack the Allied armies before they combined, in the hope of driving the British into the sea and the Prussians out of the war. His march to the frontier achieved the surprise he had planned. He forced Prussia to fight at Ligny on June 16 1815, and the defeated Prussians retreated in some disorder. On the same day the left wing of the Army of the North, under the command of Marshal Michel Ney, succeeded in stopping any of Wellington's forces going to the aid of Blücher's Prussians by fighting a blocking action at Quatre Bras. But Ney failed to clear the cross-roads and Wellington reinforced the position. With the Prussian retreat, Wellington was forced to retreat as well, however. He fell back to a previously reconnoitered position on an escarpment at Mont St Jean, a few miles south of the village of Waterloo. Napoleon took the reserve of the Army of the North, and reunited his forces with those of Ney to pursue Wellington's army, but not before he ordered Marshal Grouchy to take the right wing of the Army of the North and stop the Prussians reorganizing. Grouchy failed and although he engaged and defeated the Prussian rearguard under the command of Lt-Gen. von Thielmann in the Battle of Wavre (June 18–19), the rest of the Prussian army "marched towards the sound of the guns" at Waterloo. Napoleon delayed the start of fighting at the Battle of Waterloo on the morning of June 18, 1815 for several hours while he waited for the ground to dry after the previous night's rain. By late afternoon the French army had not succeeded in driving Wellington's Allied forces from the escarpment on which they stood. When the Prussians arrived and attacked the French right flank in ever-increasing numbers, Napoleon's strategy of keeping the Allied armies divided had failed. and a combined Allied general advance drove his army from the field in confusion. Grouchy partially redeemed himself by organizing a successful and well-ordered retreat towards Paris, where Marshal Davout had 117,000 men at the ready to turn back the 116,000 men of Blücher and Wellington. Militarily it appeared quite possible (indeed probable) that the French could defeat Wellington and Blücher, but politics proved the source of the Emperor's downfall. Furthermore, even had Davout succeeded in defeating the two northern Coalition armies, around 400,000 Russian and Austrian troops continued to advance from the east. On arriving at Paris three days after Waterloo, Napoleon still clung to the hope of a concerted national resistance; but the temper of the chambers, and of the public generally, did not favor his view. The politicians forced Napoleon to abdicate again on June 22, 1815. Despite the Emperor’s abdication, irregular warfare continued along the eastern borders and on the outskirts of Paris until the signing of a cease-fire on July 4. 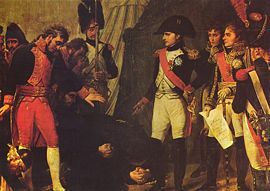 On July 15 Napoleon surrendered himself to the British squadron at Rochefort. The Allies exiled him to the remote South-Atlantic island of Saint Helena, where he died on May 5, 1821. In most European countries, the importation of the ideals of the French Revolution (democracy, due process in courts, abolition of privileges, etc.) left a mark. European monarchs found it difficult to restore pre-revolutionary absolutism, and had perforce to keep some of the reforms brought about during Napoleon's rule. Institutional legacies have remained to this day: many European countries have a Civil law legal system, with clearly redacted codes compiling their basic laws—an enduring legacy of the Napoleonic Code. A relatively new and increasingly powerful movement became significant. Nationalism would shape the course of much of future European history; its growth spelled the beginning of some nations and states and the end of others. The map of Europe changed dramatically in the hundred years following the Napoleonic Era, based not on fiefs and aristocracy, but on the perceived basis of human culture, national origins, and national ideology. Bonaparte's reign over Europe sowed the seeds for the founding of the nation-states of Germany and Italy by starting the process of consolidating city-states, kingdoms and principalities. Another concept emerged—that of Europe. Napoleon mentioned on several occasions his intention to create a single European state, and although his defeat set the thought of a unified Europe back over one-and-a-half centuries, the idea re-emerged after the end of the Second World War. 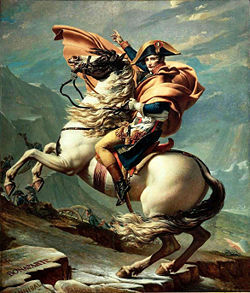 Napoléon crossing the Alps (David). Bonaparte led the French Army over the Alps, eventually defeating the Austrians at Marengo. The Napoleonic Wars also had a profound military impact. Until the time of Napoleon, European states had employed relatively small armies with a large proportion of mercenaries—who sometimes fought against their own native countries. However, military innovators in the middle of the eighteenth century began to recognize the potential of an entire nation at war: a "nation in arms." 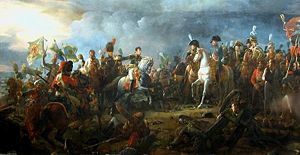 Napoleon himself showed innovative tendencies in his use of mobility to offset numerical disadvantages, as brilliantly demonstrated in the rout of the Austro-Russian forces in 1805 in the Battle of Austerlitz. The French Army reorganized the role of artillery, forming independent, mobile units as opposed to the previous tradition of attaching artillery pieces in support of troops. Napoleon standardized cannonball sizes to ensure easier resupply and compatibility among his army's artillery pieces. France, with the fourth-largest population in the world by the end of the eighteenth century (27 million, as compared to the United Kingdom's 12 million and Russia's 35 to 40 million), seemed well poised to take advantage of the 'levée en masse'. Because the French Revolution and Napoleon's reign witnessed the first application of the lessons of the eighteenth century's wars on trade and dynastic disputes, commentators often falsely assume that such ideas arose from the revolution rather than found their implementation in it. Not all the credit for the innovations of this period should go to Napoleon, however. Lazare Carnot played a large part in the reorganization of the French army from 1793 to 1794—a time which saw previous French misfortunes reversed, with Republican armies advancing on all fronts. The great sizes of the armies involved give an obvious indication of the changes in warfare. During Europe's major pre-revolutionary war, the Seven Years' War of 1756-1763, few armies ever numbered more than 200,000. By contrast, the French army peaked in size in the 1790s with 1.5 million Frenchmen enlisted. In total, about 2.8 million Frenchmen fought on land and about 150,000 at sea, bringing the total for France to almost three million combatants. The United Kingdom had 747,670 men under arms between 1792 and 1815. In addition, about a quarter of a million personnel served in the Royal Navy. In September 1812, Russia had about 904,000 enlisted men in its land forces, and between 1799 and 1815 a total of 2.1 million men served in the Russian army, with perhaps 400,000 serving from 1792-1799. A further 200,000 or so served in the Russian Navy from 1792 to 1815. One cannot readily find consistent equivalent statistics for other major combatants. Austria's forces peaked at about 576,000 and had little or no naval component. Apart from the United Kingdom, Austria proved the most persistent enemy of France, and one can reasonably assume that more than a million Austrians served in total. Prussia never had more than 320,000 men under arms at any given time, only just ahead of the United Kingdom. Spain's armies also peaked in size at around 300,000, but to this one needs to add a considerable force of guerrillas. Otherwise only the United States (286,730 total combatants), the Maratha Confederation, the Ottoman Empire, Italy, Naples and Poland ever had more than 100,000 men under arms. Even small nations now had armies rivaling the Great Powers' forces of past wars in size. However one should bear in mind that the above numbers of soldiers come from military records and in practice the actual numbers of fighting men would fall below this level due to desertion, fraud by officers claiming non-existent soldiers' pay, injuries and death, and in some countries deliberate exaggeration to ensure that forces met enlistment-targets. Despite this, the size of armed forces expanded at this time. The initial stages of the Industrial Revolution had much to do with larger military forces—it became easy to mass-produce weapons and thus to equip significantly larger forces. The United Kingdom served as the largest single manufacturer of armaments in this period, supplying most of the weapons used by the Allied powers throughout the conflicts (although using relatively few itself). France produced the second-largest total of armaments, equipping its own huge forces as well as those of the Confederation of the Rhine and others. Another advance affected warfare: the semaphore system had allowed the French War-Minister, Carnot, to communicate with French forces on the frontiers throughout the 1790s. The French continued to use this system throughout the Napoleonic wars. Additionally, aerial surveillance came into use for the first time when the French used a hot-air balloon to survey Allied positions before the Battle of Fleurus, on June 26, 1794. Advances in ordnance and rocketry also occurred in the course of the conflict. This page was last modified on 7 November 2018, at 15:38.